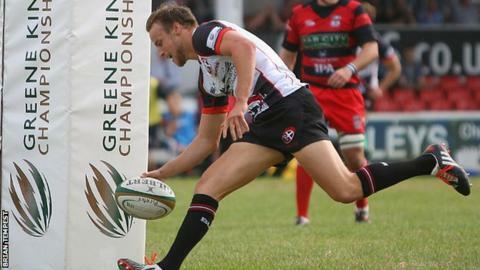 Cornish Pirates boss Ian Davies says fans can "calm down" after beating Moseley for a first win of the season. First-half tries from Tom Kessell, Matt Evans and Aaron Carpenter helped the Pirates into a 19-0 lead at the break. Kieran Hallett's penalty extended the lead, but Moseley scored three tries to narrow the score before Kessell's second try late on sealed a 29-19 win. "It's a first win and some of the fans can calm down now and stop panicking," Davies told BBC Cornwall. "The three teams we played at the start of the season are everybody's favourites to be in the top four." "All the supporters and the keyboard warriors on the forums were saying this was a 'must-win game'. "It wasn't: what we spoke about was that we must not let our physicality drop, not let our concentration drop. "We did that and we saw in the first half where we kept it at those levels that teams struggle to keep in touch with us." The Pirates lost their opening three games to Yorkshire Carnegie, London Scottish and Bristol and Davies said that the fixture list had handed his side a particularly difficult start to the campaign. "The three teams we played at the start of the season are everybody's favourites to be in the top four come the end of the season," he said. "Doncaster next week will be a really tough game, it's never an easy place to go. But we've got a win and we move on to next week."